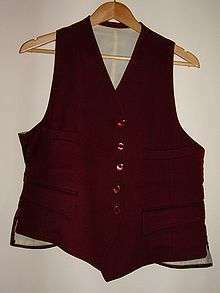 A waistcoat (/ˈwɛskət/ or /ˈweɪstkoʊt/; often called a vest in American English, and colloquially a weskit) is a sleeveless upper-body garment. 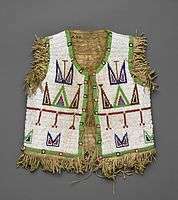 It is usually worn over a dress shirt and necktie and below a coat as a part of most men's formal wear. It is also sported as the third piece in the traditional three-piece male business suit. 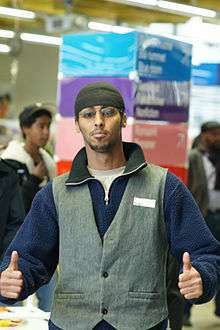 A young man wearing a modern waistcoat. Woman in a modern denim waistcoat. During the seventeenth and eighteenth centuries, men often wore elaborate and brightly-coloured waistcoats, until changing fashions in the nineteenth century narrowed this to a more restricted palette, and the development of lounge suits began the period of matching informal waistcoats. French waistcoat in silk, circa 1750, LACMA. 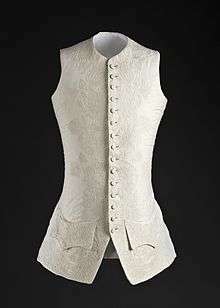 French waistcoat in cotton, circa 1760, LACMA. Guitarist Ruthie Morris of Magnapop wearing a leopard print vest on stage.